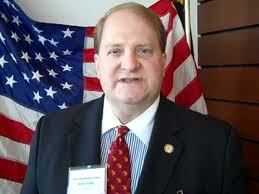 Jonathan Jordan was elected in 2010 and has served four terms. Previously working for the right-wing John Locke Foundation, Jordan has maintained his strong relationship with the group’s founder, Art Pope. Since being in office, he has accepted thousands of dollars in campaign contributions from associated groups and consistently voted for legislation in line with Pope’s radical right-wing vision for North Carolina. North Carolina deserves a legislator that will put the needs of North Carolina first, not wealthy benefactors. Jordan has spent his eight years in the legislature undermining education in NC. Because of Jordan’s votes, education remains insufficiently funded. North Carolina teacher pay has not meaningfully increased during Jordan’s time in office. Jordan has supported legislation that takes money away from public education and diverts it to private schools, prioritizing his private interests over the wellbeing of students across the state. To make it even worse, Jordan has accepted campaign contributions from groups who do not care about North Carolina’s future for education. Jordan cares more about his own pocket than our teachers and students. Jordan voted against expanding Medicaid to North Carolinians, causing costs to skyrocket for all North Carolinians and especially those who need it the most – it’s a big part of why we have the 3rd most expensive health care in the country. Clearly in line with Art Pope’s agenda, Jordan’s vote against Medicaid expansion actively hurts North Carolinians and limits access to healthcare. Jordan, having received donations from Duke Energy, chose to not hold them accountable after their coal ash spill in 2016 and to pass the cost onto the ratepayers. After the spill, legislation was introduced that would free Duke Energy from the responsibility of cleaning up the disaster they caused. This ultimately saved Duke Energy billions of dollars, at the expense of North Carolinians and the environment. Read on for more about Jordan’s record of placing his relationships. At the 2009 Republican Legislative Campaign Committee’s national meeting, Thomas Hofeller (yes, that name sounds familiar) presented the strategy Republicans would use to boost wins in 2010 and beyond, according to recently released court documents. 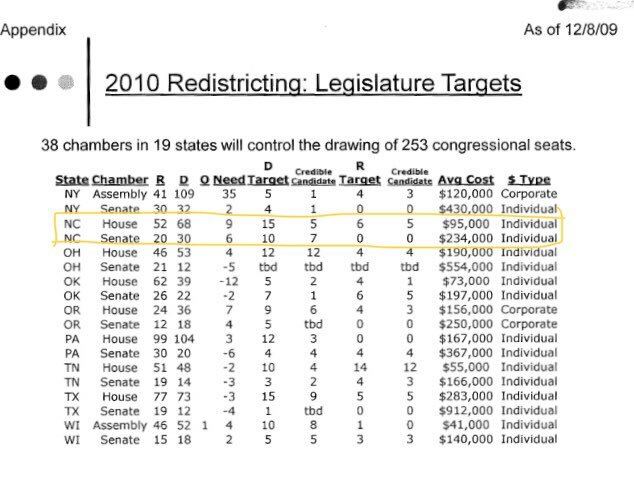 Hofeller’s June 2009 presentation, “2010 Redistricting: Preparing for Success,” explains why Republicans dominate the NCGA with a seemingly impenetrable super majority. The GOP’s strategy to “reinvent the gerrymander” was successful in North Carolina. By December 2009 the presentation included the Republican State Leadership Committee’s plans to bankroll 2010 legislative races in North Carolina, $95,000 in the House and $234,000 in the Senate. Winning key races would allow RSLC to implement its REDMAP strategy across the U.S. The REDMAP plan gives key insight into how Republicans have maintained control of the N.C. General Assembly. Art Pope put forth his own money for REDMAP, and RSLC sent $1.25 million to Pope’s network to elect Republicans in 2010. Pope spent around $2.2 million to accomplish that goal. Did Art Pope break his pledge to step away from politics as State Budget Director? In December 2012, when then-Governor Pat McCrory announced Art Pope’s appointment as State Budget Director he said Pope promised to take time off from his other commitments, but Bradley Foundation documents show Pope’s influence on the organization was beginning to grow while he was budget director. Despite that pledge, Pope continued to fund North Carolina conservative political groups as a board member of the right-wing Bradley Foundation. Pope joined the Bradley board in 2012 and continued to serve during 2013 – while also serving as State Budget Director. Pope was named Chair of the Bradley Foundation Board in 2017. We have previously covered the Bradley Foundation’s growing influence in North Carolina and its plan to bring the “Wisconsin model” to other swing states. Now it is clear that Art Pope was continuing to fund right-wing political committees in North Carolina at the same time he was a state employee.